Hall of the Mountain King: Review: Ted Nugent, "Shut Up & Jam"
There are also some fun, if a bit cheesy moments, and a few really, really good rock ‘n’ roll songs. It’s a bit funny, considering his outspokenness, that the title song, which is also the album opener, calls for “enough of that political stuff” and expresses his boredom with politics: “Right, left, good, bad, it all gets boring and old/the only hope for America is good old rock ‘n’ roll,” he sings in the first verse. That stance only lasts a couple of songs, of course, but it’s a fun and energetic tune to get things going. 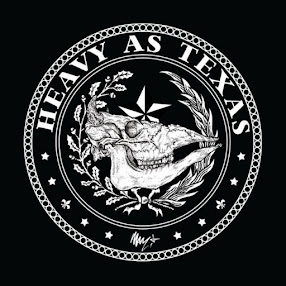 Second track “Fear Itself” opens with a nice riff that gives way to another one of those vocals – and there are several on the album – where Nugent sounds a bit like a caricature of himself. Somehow, though, his inherently goofy nature makes it work for him. Like many of the songs on the album, “Fear Itself” expresses a very positive and upbeat message that even his detractors should be able to get behind. Another one of those moments comes on “Never Stop Believing,” one of a few of the more restrained numbers on the record. It shows some nice riffing, and though Nugent’s vocal isn’t bad, I would like to have heard it with the Derek St. Holmes vocal, as I think it fits him a little better. Speaking of St. Holmes, he does make an appearance. I have to admit that, in the past, I’ve always preferred the Nugent-sung songs to St. Holmes’ efforts. St. Holmes is, inarguably, the far better singer, but Nugent’s songs were always louder, wilder and crazier. On this record, though, it’s St. Holmes that provides the highlight on “Everything Matters,” a rhythm and blues-influenced piece. Nugent focuses on delivering some tasty licks, and St. Holmes delivers in a big way on a song that, as Nugent said in a recent interview, seems to be written especially for him. It’s easily one of the highlights of Shut Up & Jam. Together, they just lay back, dial down the attitude and focus on the song. The other guest shot, from Sammy Hagar on “She’s Gone,” is almost equally entertaining, conjuring up images of some of Nugent’s best work with St. Holmes in the 1970s. 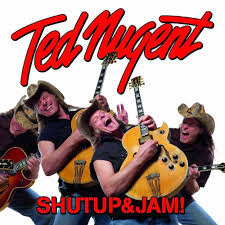 Of course, it being a Nugent album, you’re going to have some crazy, goofy tunes that range from fun to absurd. On the fun end of the spectrum is “I Love My BBQ.” It’s easily one of the silliest pieces on the record, but it has a catchy, cool groove that wins you over and, despite yourself, you end up walking around hours later singing it in your head. One song that surprised me a bit was “Semper Fi.” The title had planted an idea of what might be coming before I heard the song. It turned out to be a pretty nasty, grooving rocker that, despite lacking a little bit of lyrical creativity, is one of the better tunes on Shut Up & Jam. At the end of the day, this album tells you what you already know about Ted Nugent – he loves America, he loves his barbecue and he loves being the center of attention. While it’s not his strongest outing, it’s a perfect example of what he does. If you’re a fan, you’ll enjoy it. If you’re one of the folks that hates him, well, you’re probably not listening to it anyway.